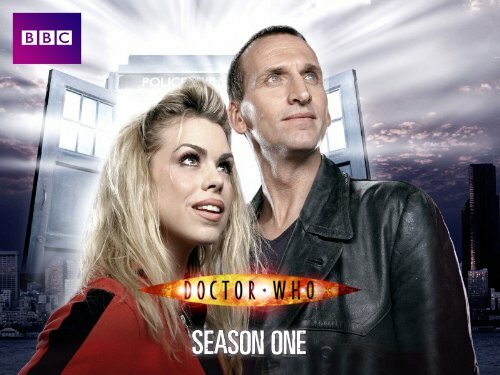 In this continuation of N012 Bad Wolf, first series finale of the Doctor Who revival, and Last Hoorah of Eccleston as the 9th Doctor, The Doc and Captain Jack arrive aboard the Dalek spaceship only to meet the monster behind the monsters, the Dalek Emperor himself. Unfortunately, said emperor has gone completely bonkers, created a race of Daleks out of human bio-matter and declared himself a deity. And though Doc and Jack rescue Rose for the time-being, the Daleks head after them to Satellite 5 (aka The Game Station) to kill every human being around and create paradise on Earth. Dalek Emperor: Count the nut sacks! Pretty sure you're outside of that forcefield now, Doc. Satellite 5: Count the dongs! Rose becomes the Bad Wolf. An excellent show, but it’s too long. All the reality television stuff could have been cut down to half the time. The Daleks are superb. And we see Tennant for the first time. As Tennant was my first Doctor, I saw the Eccleston episodes quite late. And I really like Eccleston; he should have done more. But I still didn’t get what’s up with Barcelona? Perhaps the almighty JD could enlighten me there? If the Tardis can grant the power of simply erasing the Daleks; can’t the Tardis do this herself? Perhaps the Doctor should sometimes simply ask his police box to arrest the villain? But this might get boring over time, so perhaps it’s better not to ask. The Doctor in the Big Brother house, anyone else feel like they lost a bet for ‘Things most unlikely to happen on Doctor Who’? So this is the big finale of Doctor Who’s first revived series and it’s a damn good one. Bad Wolf is a surreal episode with The Doctor and co. trapped in twisted versions of modern-day game-shows. It gives me a bit of kick that some American viewers unfamiliar with British game-shows actually believed that they were a good fictional satire on the whole genre of TV, not that they aren’t but having them based it reality really does heighten that feeling. It’s a solid, intriguing episode with the mystery of who rules the Bad Wolf corporation. I’ve mentioned before my love of The Doctor’s line ‘I created this world’, a wonderful bit of recompense for his actions. Made even worse when it’s revealed to be his greatest for who used his failure to their benefit. The finale of Bad Wolf, with the reveal of the Dalek’s ‘ALERT ALERT, WE ARE DETECTED’ always sends shivers up my spine. The Doctor’s ‘No’ speech is brilliant an I think this is one of the best cliffhangers in all of Who. Parting of the Ways follows through with gusto with a terrific opening, brining in the extrapolater from Boom Town, avoiding any Deus Ex Machina resolution complaints. The side characters are fleshed out well to win out sympathy, or lack of, in the case of Roderick. The Daleks here are a massive threat, exterminating for the sheer hell of it (just as they should), slowly invading the station. There are creepy moments of brilliance such as the noiseless extermination of Lynds, the cries of the dying contestants, and more comedic moments such as the Anne-Droid vs. Daleks amount to a dreadful air to the whole thing. The Dalek Emporer’s booming, zealotry driven voice is a perfect enhancement of what makes the Daleks scary, and he body horror is enhanced all the more with his sickening line of the ‘sifted, pulped’ humans becoming Daleks. Think how revolted The Doctor must be that his treasured human race are corrupted to Daleks. The threads throughout the series all come to a close here with Mickey, Jackie’s mention of Pete, and her reluctance to send Rose into danger all harken back to Father’s Day and Aliens of London. And she’s right, Rose would have died, just as everyone else on the station does at the end of this story. Jack, Lynda, Roderick, the budding romantic office workers – no one is safe from the Daleks. The Bad Wilf series arc ends with The Doctor’s redemption. He won’t repeat his actions, he won’t commit genocide once again. The companion saves the day, with a little help from the TARDIS, and The Doctor sacrifices his life for Rose. His regeneration is exactly what we need from an outgoing Doctor – reassuring, accepting, and celebratory of the life he led in this incarnation. A far cry from Tennant’s which I’ll discuss my disdain for at a later date! The 9th Doctor re-introduced a whole new generation to the magic of Doctor Who. Christopher Eccleston, although reluctant to re-visit the role, gave his all in his performance and portrayal of the darkest Doctor we’d seen to date. It’s brilliant then that even out of this, in a story where everybody dies, we are reminded of the warmth he brought to he role – a time when everybody lived, grooving to Britney Spears with a wide grin, saving planets and stopping evil. In a word, he was Fantastic. Bad Wolf/Parting of the Ways gets a 4.4 from me.